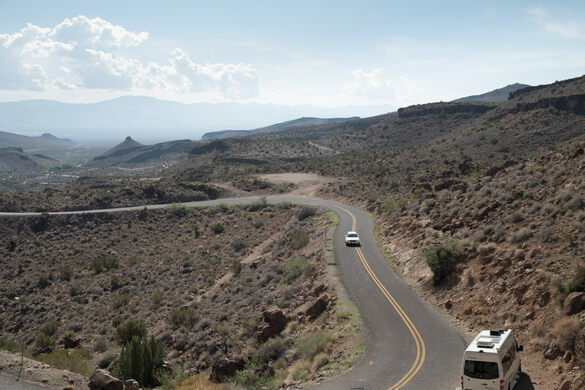 While driving this arid stretch of Route 66, keep your eyes peeled for a staircase built into one of the cliffs. It leads to a secret spring bubbling with life, tucked out of sight along the most famous road in the United States. A man named Shaffer created this hidden roadside wonder in the 1930s under the Works Progress Administration. 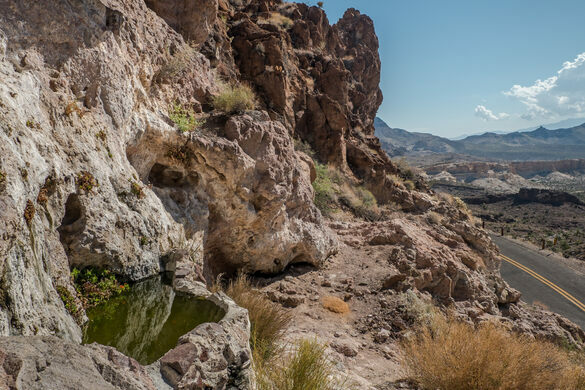 While constructing the “Gold Road Section” that weaves between Gold Road Mine and Kingman, Arizona, he noticed water cascading down the cliff walls. To take advantage of the precious resource, he built a basin of stones at its base to allow the water to pool. This minute, secluded oasis soon became a welcome refuge for the weary travelers and parched animals passing through. Because the water stems from a consistent natural source, the bowl remains full year-round. Locals frequently keep it stocked with goldfish (leading some to call it the “fish bowl spring”), and the snails clinging to its walls help keep the algae at bay so the water stays fresh. Desert-dwelling animals like bees and burros still frequent the site to quench their thirsts. Humans, however, are less common. Only travelers who already know of its existence or those who happen to spot the stairs will ever stumble upon this secret spring. It is located around mile marker 30. There is room to safely park your car without worrying about blocking traffic. This is a pretty remote road, so you are likely to see few cars or people regardless. There are about 30 small steps leading up to the spring. Be aware there are no handrails and the steps are uneven. Once you climb the steps you will see the fishbowl in all its glory. Go on a clear day as the sights along the drive are amazing. There are great photo opportunities. Continue driving to the Oatman Ghost town which has many interesting shops, an inn, saloon, and a whole town of burros.